CHFI v9 covers detailed methodological approach to computer forensic and evidence analysis. It provides the necessary skillset for identification of intruder’s footprints and gathering necessary evidence for its prosecution. 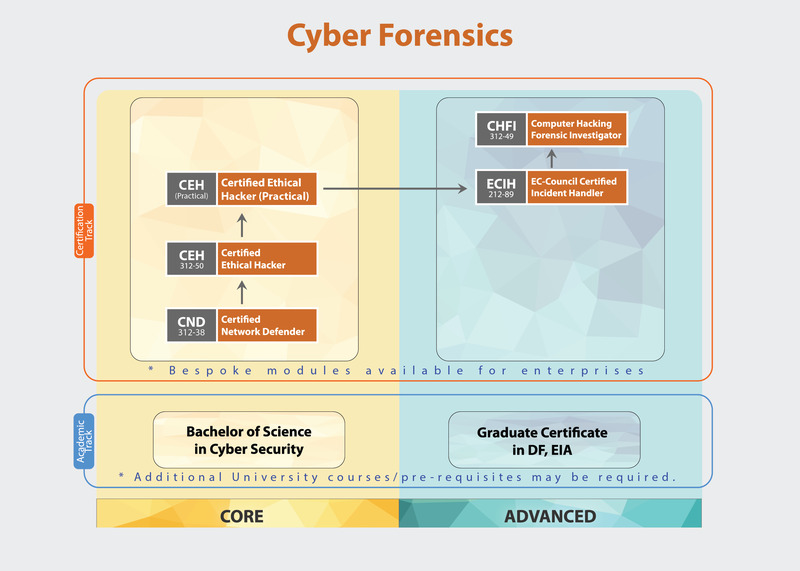 All major tools and theories used by cyber forensic industry are covered in the curriculum. The certification can fortify the applied knowledge level of law enforcement personnel, system administrators, security officers, defence and military personnel, legal professionals, bankers, computer and network security professionals, and anyone who is concerned about the integrity of the network and digital investigations. Students are able to perform bit-stream imaging/acquiring of the digital media seized during the process of investigation. Students are able to investigate and analyse all response activities related to cyber incidents. Students are able to plan, coordinate and direct recovery activities and incident analysis tasks. Students are able to collect data using forensic technology methods in accordance with evidence handling procedures, including collection of hard copy and electronic documents. Students are able to maintain awareness and follow laboratory evidence handling, evidence examination, laboratory safety, and laboratory security policy and procedures. Students are able to ensure that reported incident or suspected weaknesses, malfunctions and deviations are handled with confidentiality.